hope that you all had a great weekend and that you're ready for the week ahead? Today I'm showcasing the fabulous NanaConnie who will be the GDT for our next challenge. 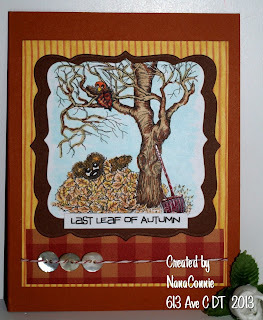 NanaConnie won the opportunity with this beautiful, autumnal card featuring this adorable and witty image which she has beautifully coloured and displayed. Love the clean, neat layout and the perfectly co ordinating papers. With postage costs going up and up and up more and more 'postable' cards are being created by all of us now, I think, and this one's a perfect example. I just love the way NanaConnie has threaded the twine through the buttons to hold them in place...great idea. I'm sure she would love a visit. I've seen the beautiful card that NanaConnie has already made us for the next challenge and it really is fabulous, so don't forget to head back here on Sunday to check it out and to join in with challenge #3. There is still plenty of time to enter the current challenge which can be found if you click on either the tab at the top of the page or the blinky at the top of the right hand sidebar. And if you would like to be considered as the next GDT and be showcased on the blog then you must add GDT after your name when you enter. If anyone forgets to do so, simply leave a comment saying you'd like to have it added and I can do it for you. Entries close at 6 pm (GMT) this coming Friday. Good luck. And don't forget this fortnight's blog candy. The information can be found on the blinky towards the top of the right hand sidebar. Take care everyone and happy crafting! Gorgeous card. I love the autumnal colours of it.